Travellers from Rome find many reminders of their hometown on Malta. 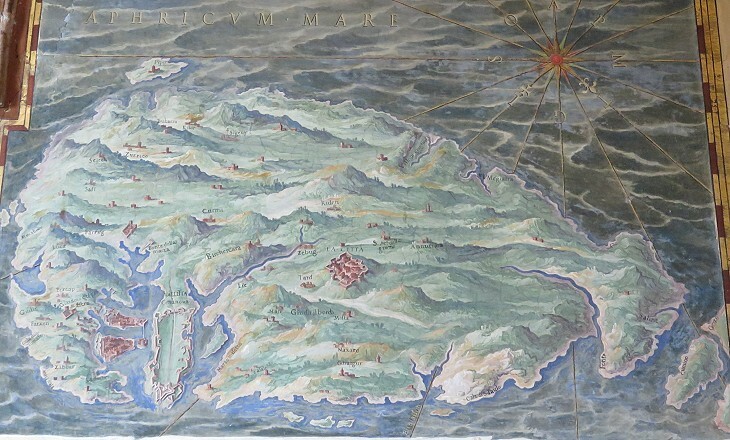 This page deals with some aspects of the historical, religious and artistic ties between Rome and Malta. There are more chances to see the statue of a pope in the streets of Malta than in those of Rome. Many towns of the former Papal State have a large statue of a pope in their main square (see that of Pope Julius III in Perugia), but in Rome the popes preferred to place their statues inside churches or in Palazzi del Campidoglio, probably because they feared they could be damaged during riots. 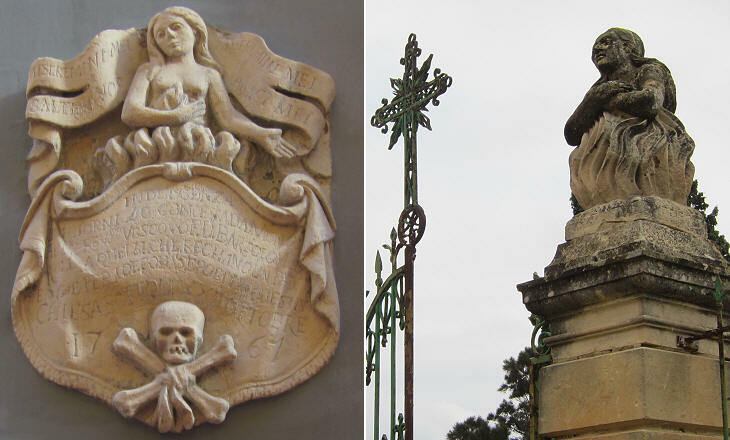 Usually the façades of Maltese churches bear the coats of arms of the Bishop and/or of the Grand Master who were in charge at the time they were built, but in some instances tribute was paid to the reigning pope by placing his coat of arms. 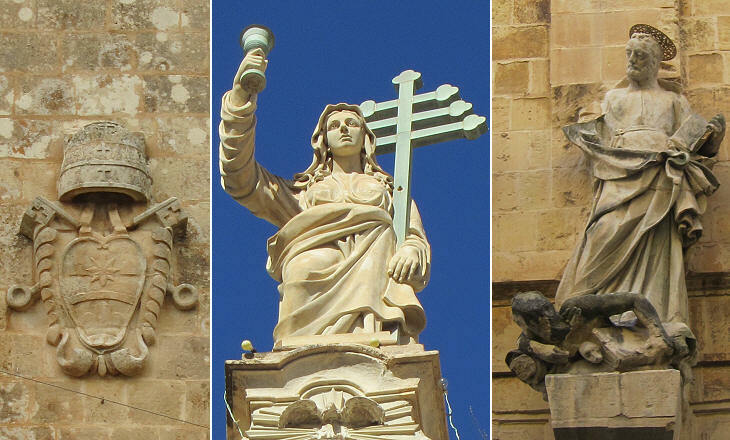 The statue of Religion at St. Dominic's in Valletta bears a bronze cross and raises a bronze cup similar to the gigantic statues of Jesus Christ and the Apostles at the top of St. Peter's in Rome. 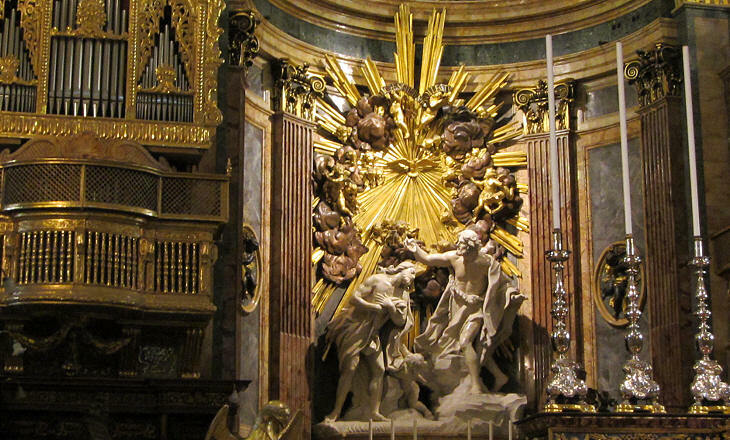 The statue of St. Ignatius in the Jesuit church of Valletta resembles that which decorates the façade of il Gesù in Rome. In 1603 a book by Cesare Ripa was published in Rome which set guidelines for the portrayal of Virtues and a host of other personifications, such as Time, Love, the Seasons and the Months, etc. 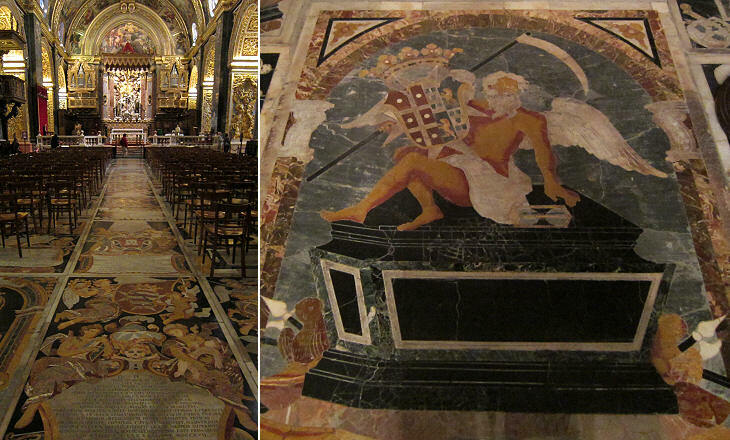 These rules were adopted by all painters and sculptors and they were followed on Malta too. 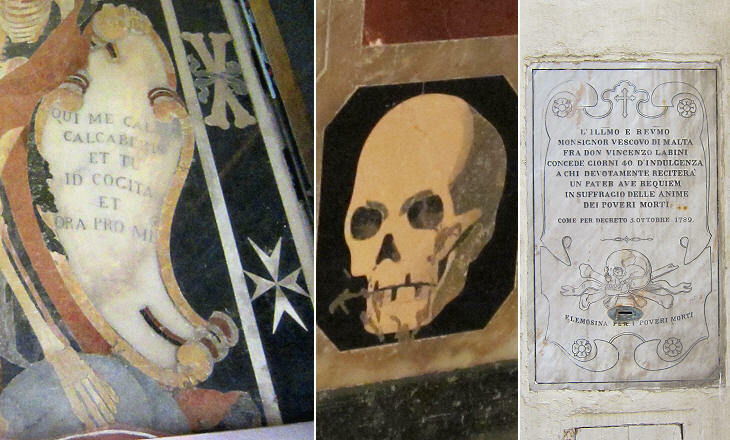 In Rome (and on Malta alike) during the XVIIth and XVIIIth century reminders of Death often decorated not only funerary monuments, but also façades of churches and alms boxes. They were often accompanied by gruesome inscriptions such as that on one of the gravestones shown above: Qui me calcas, calcaberis (he who treads on me, will be trodden). Indulgences, i.e. the remission of temporal punishments in Purgatory have a key importance for the Roman Catholic Church. Souls in Purgatory are believed to be purified by a cleansing fire (The Church formulated her doctrine of faith on Purgatory especially at the Councils of Florence and Trent. The tradition of the Church, by reference to certain texts of Scripture, speaks of a cleansing fire. - Catechism of the Catholic Church). The duration of this purification process can be shortened by prayers. On Malta souls in Purgatory were portrayed as young women surrounded by flames. In the second half of the XVIth century the Roman Catholic Church issued guidelines for the representation of saints; painters and sculptors were recommended to emphasize the role of the ancient martyrs and their heroic sacrifices. Eventually this led to depicting torture scenes. On Malta this practice continued well into the XIXth century. 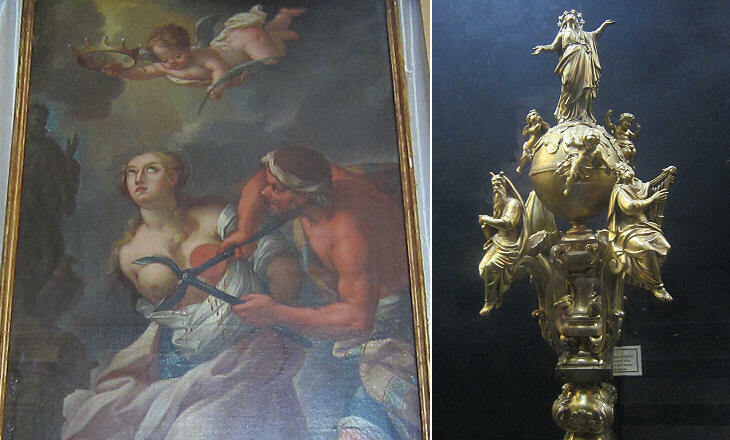 The frightening painting showing the martyrdom of St. Agatha was moved to a museum only very recently. In 1857 Pope Pius IX erected a column in Piazza di Spagna to celebrate the Immaculate Conception of the Virgin Mary dogma. A silver mace in the Treasury of the Cathedral of Victoria has the same structure and personages as the column. 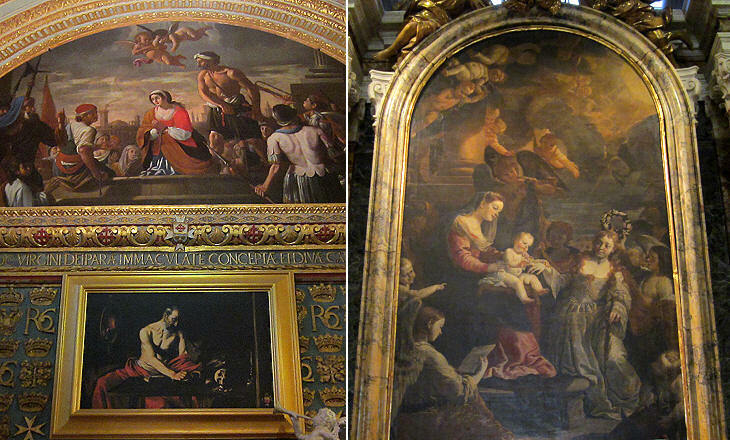 From an artistic viewpoint a key link between Rome and Malta is represented by the works of two Italian painters, who although not being born in Rome, spent many years in the Eternal City before moving to Malta. Melchiorre Caffà (in Malta Melchiorre Gafà) is an artist who travelled the other way round from Malta to Rome where he became a much appreciated sculptor (you can see other works by him in this website). In 1667 Melchiorre Caffà died of injuries resulting from an accident which occurred while he was working at a foundry in Rome at the preparatory cast of a bronze group for the apse of St. John's. 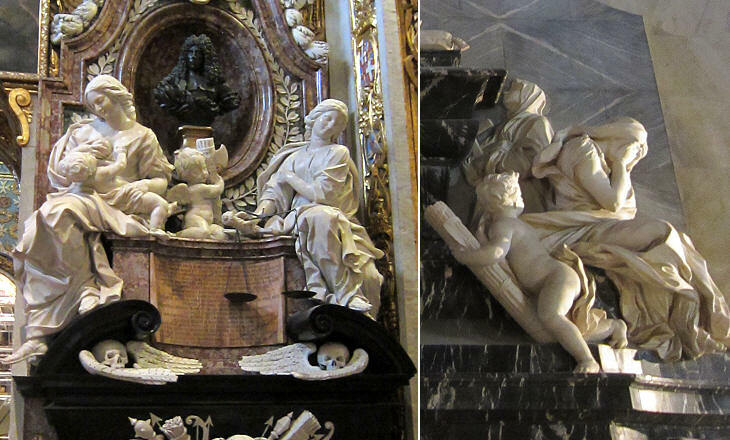 The statues were eventually made in marble by Giuseppe Mazzuoli, his assistant; they are very similar to those made at the same time by Antonio Raggi for Cappella Falconieri in S. Giovanni dei Fiorentini. 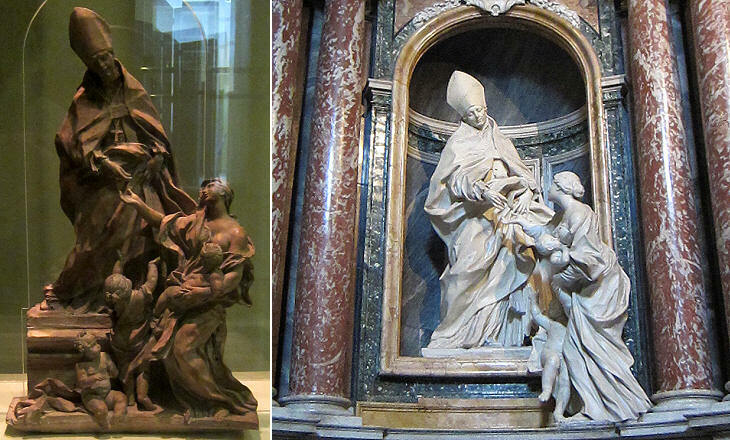 Guidi was a sculptor who was not part of Gian Lorenzo Bernini's inner circle. 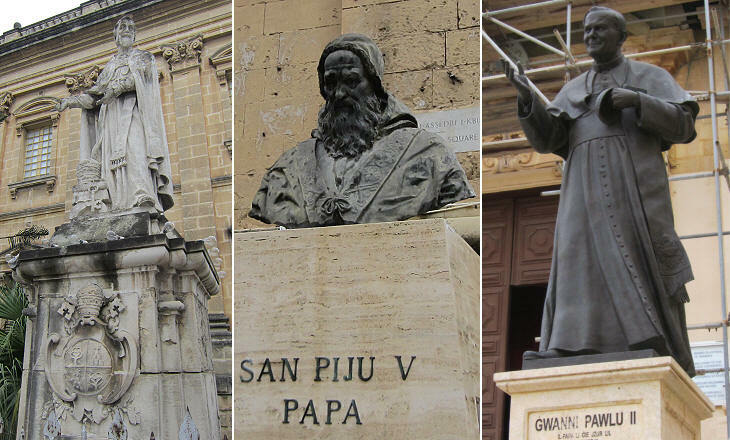 He had a very active workshop; his statues can be found in several Italian towns and in Germany and Spain in addition to Malta. 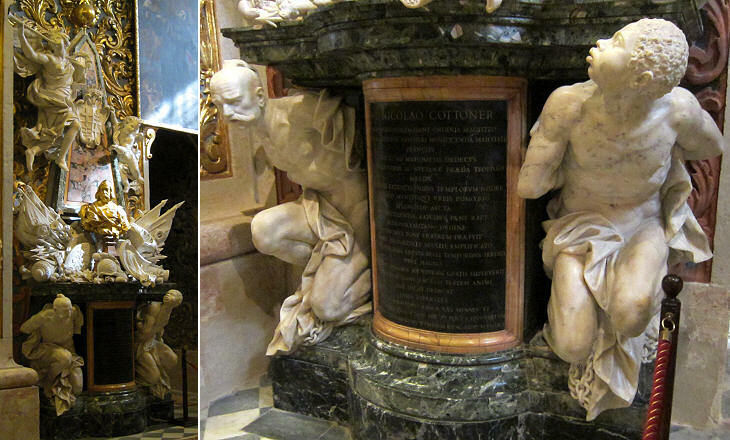 The monument to Grand Master Coroner follows patterns set in several monuments to the popes, although the dead individual is portrayed in a bust, rather than seated on a throne, probably because of space constraints. The monument to Grand Master Perellos, consistent with the Roman tradition, shows the dead between two Virtues (Charity and Justice). The putto bearing the fasces which are a symbol of Justice was devised by Bernini to portray this virtue as a crying woman (more on this topic). In the monument to Perellos the putto has the mere purpose of filling an empty space. The image used as background for this page shows a large flag of the Holy See at Victoria.